Daal Mekhani recipe by Ghazala at DesiRecipes.com. 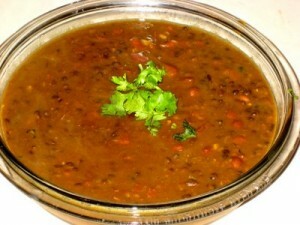 1/2 cup of whole Urad Daal(soaked in water for about 8 hours). 1/8 cup of Kidney beans(soaked for about 8 hours). 1 tsp shredded Ginger . 1 Green Chilli (finely chopped). 1/2 tsp mango powder(amchoor ). 1/2 tsp cumin seeds (zeera ). Put presoaked Daal and kidney beans in a pot with 3 cups of water. Add green chillies, ginger , turmeric powder and salt . Cover and cook on medium heat for about 25 min or until the beans and daal are tender. Mash it a little bit to make it creamy. Let it cook for about 5 more min. Then add heavy cream, mango powder(amchoor ) and garam masala. Mix it well and let it cook for few minutes on low heat. Now in a fry pan heat 2 tbsp oil. Put cumin seed and red chillies and sizzle them till it gets medium brown. Garnish Daal with this mixture. You can also add little bit of cream/finely chopped ginger /corriander leaves for garnishing. Daal Makhani is ready to be served. Serve hot with Chappati or tandoori roti. Recipe has been fixed. Sorry for the inconvenience. thx.my husband gonna like it.